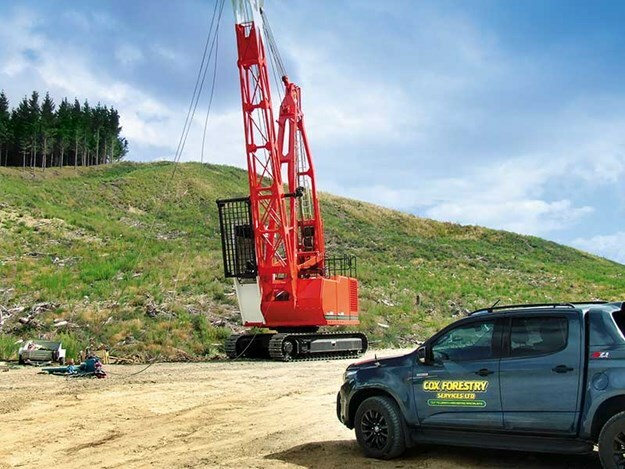 Hawke’s Bay-based cut-to-length harvesting specialists Cox Forestry Services has taken delivery of a new 124 Madill swing yarder. 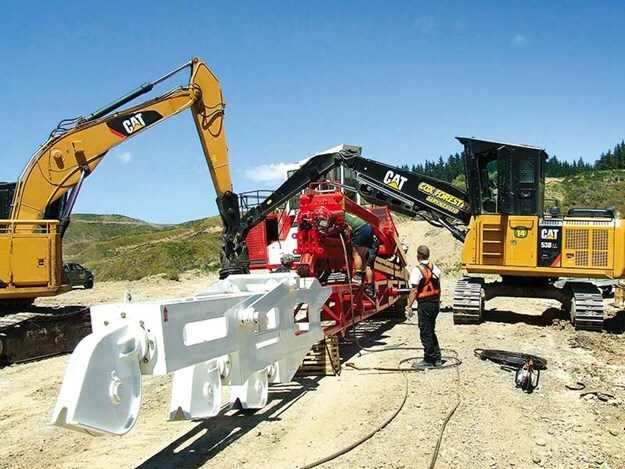 The swing yarder was ordered last year through Porter Equipment, agents for Madill forestry equipment in New Zealand. Madill are built in Canada by Nicholson Manufacturing Limited and Cox’s machine arrived on-site in February. I am told it was the fourth new 124 Madill into New Zealand and I was fortunate to see it assembled and pull its first log. The arrival was well supported by Madill and Porters, with local sales and support staff along with a product support specialist for Madill who has 35 years’ experience coming over to oversee assembly of the machine. The transition into hauler logging has been made easier for Cox Forestry Services since engaging the services of a Canadian logger who has spent a lifetime on haulers. Murray started in the bush in Canada when he was 17 and at 59, he is now passing on valuable experience; this logger has probably forgotten more than what most loggers know and this was quiet evident when the first log was pulled. He had not been on a Madill swing yarder for five years, but it looked like he’d only been off the machine for no less than five minutes. I am told that in one week, the Madill machine averaged around 330 tonnes per day, and Luke Cox, co-owner of Cox Forestry Services, expressed that the transition has been reasonably straightforward and incident-free. The 124 Madill is a fully interlocking swing yarder and at 52 tonnes is a large piece of equipment. Powered by a Detroit Series 60 Tier III 450hp turbo-charged engine, it’s mated to an Allison 4500 OFS Powershift transmission with auto lock-up torque converter. The winches are made specifically for Madill; this is one serious piece of logging equipment. Cox Forestry Services continue with their goal to be fully mechanised and it’s evident with their recent purchase. The camera mounted on the grapple has eliminated the need for breaker outs (people) on the ground, one of the most dangerous jobs in logging. The 124 Madill is not a mass produced machine. It has a unique look and is hand built. What I found surprising was the operator cabin with rear-entry cab had no rotating seat, which made it a bit of a squeeze to get into the operator’s seat. Also, being a specialist machine, I would have like to have seen a fold-down passenger seat so learners can get instruction from a qualified operator. These were the only areas of the machine I felt could be worth looking at. The cab is well guarded with the cab guard mounted on the side of the boom. For Blain, co-owner of Cox Forestry Services, and Luke, this is another step in building a comprehensive flexible logging business capable of handling any type of logging required. The continued push by the company has never wavered from their goal of being completely mechanised at all times. All of their equipment is kept to a high standard with clean cabs and clean machines; coupled with high production targets bursts the myth that just because you are in logging, it does not give you a licence to be reckless. When you spend eight to 10 hours every day behind the controls, it’s easier to operate from a clean environment resulting in safe efficient logging. Most young loggers set certain goals when they make their first foray into the industry, whether it is to be the best harvest processor, harvest faller, or loader driver, or being able to turn your trucks round safely and efficiently with a well stacked load on board. The same holds true for the Cox brothers. Cox Forestry Services had humble beginning with both brothers leaving school and going into the logging industry. They worked for a number of contractors over the years, gaining valuable experience and qualifications to eventually form Cox Forestry Services in 2002. They put their bank balance on the line and purchased their first machine—a Clark 664 rope skidder; not long after that a Bell Feller Buncher was added. As with all new-comers, there are ups and downs—second hand gear always breaking down, repairs and maintenance, two years tax to pay in your second year; the list goes on—but if you survive these first few years and get yourself in the position to purchase new equipment after doing battle with the finance companies, the sleepless nights start to disappear and you can start to build yourself a respectable logging business. In the early stages, Luke saw the opportunity to leverage technology for a more mechanised approach to harvesting. The benefits of this thinking resonated so powerfully with the Cox brothers that they researched and learnt all they could from various mechanised harvesting operations. The breakthrough came with a trip to Elmia Forestry Fair in Sweden, where they became convinced that "cut-to-length harvesting was the most efficient logging system on the planet". The brothers add that since the trip to Sweden, Cox Forestry Services has proven that their mechanised logging systems bring benefits to forest owners. With the introduction of the Madill 124 swing yarders, the brothers are one step closer to achieving their vision. They say, "We now have an enviable track record in creating efficiencies for forest owners, coupled with a reputation for hard work; the company has exceeded its growth projections bringing hard-won rewards." Luke and Blain both have their feet firmly planted on the forest floor. "It is our privilege to work in your forest," they say. With a lifetime of forestry in their blood, they hope to continue safe and efficient logging services. Do you log your own wood?